As pointed out by Travis recently, keyboard design does not generally inspire wonder or generate much in the way of excitement. On occasion though, someone comes up with a proposal that’s a little different and worthy of further investigation (like the Maximus mentioned in the earlier article). A recent example of this is the prototype MiniGuru from GuruBoard. At face value it might just look like a bare-bones keyboard (the keys not being surrounded by any form of bezel) but taking a closer look reveals some interesting, and rather clever, innovations. 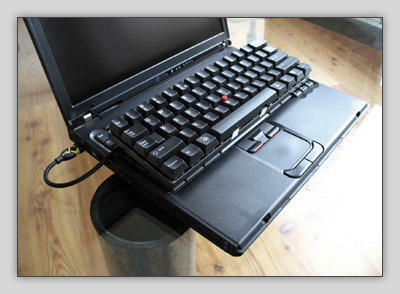 For instance, with a footprint no bigger than the alpha part of a standard keyboard, the body made from lightweight and strong aluminum and large non-slip rubber feet on the base, the MiniGuru should comfortably sit on top of notebooks or laptops for extra keying comfort and functionality whilst out and about. One of the things that separates this device from others is its programmability and customization potential. The layout of the keys on the MiniGuru can be user-controlled. So if you fancy trying the lesser-known-but-more-comfortable Dvorak configuration, such things can be easily stored, or will already be available, in the keyboard’s firmware and switched on and off at the whim of the typist. If, however, you view existing layouts as somewhat limiting or uncomfortable then you can design your own, “programming a key just takes seconds and the result is permanently stored in the keyboard’s firmware”. And if you think that your layout might be useful to others, you can share it on GuruBoard’s website. Is there a downside to all of this user-centric configuration power? Well, there could be. It all depends on ability, the ability to touch type. Those, like me, who have developed the gift will no doubt find the MiniGuru a must-have peripheral, offering limitless customization possibilities and being portable and ergonomic to boot. True, the device can be used like a standard QWERTY keyboard with each key proudly displaying a letter or symbol for all to see but that would, in my humble opinion, somewhat limit the awesome potential that this device offers by leaving the key face blank and having users commit the key map to memory instead. Such things are decided by visiting the Configurator page on the website. A host of options are on offer including the body and keycap color, whether you want a vertical or horizontal Enter key and layout language choices. The main focus of the MiniGuru is to keep the user’s digits as close to the home row as possible, “meaning the index fingers resting on the F and J keys”. 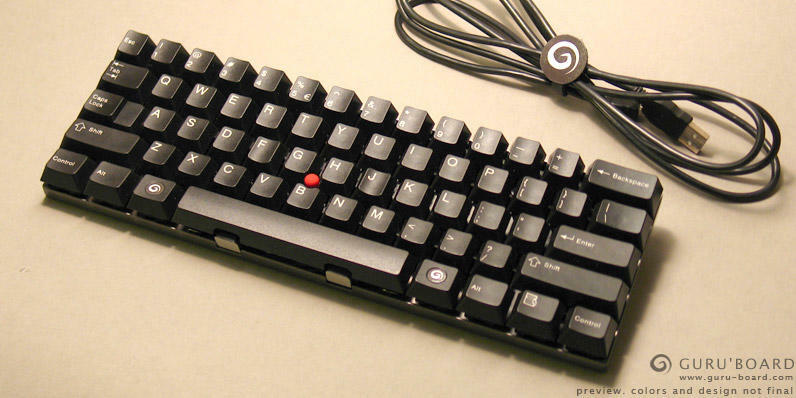 A standard QWERTY keyboard forces the user to constantly move about to use things like the cursor keys, a number pad or a mouse. 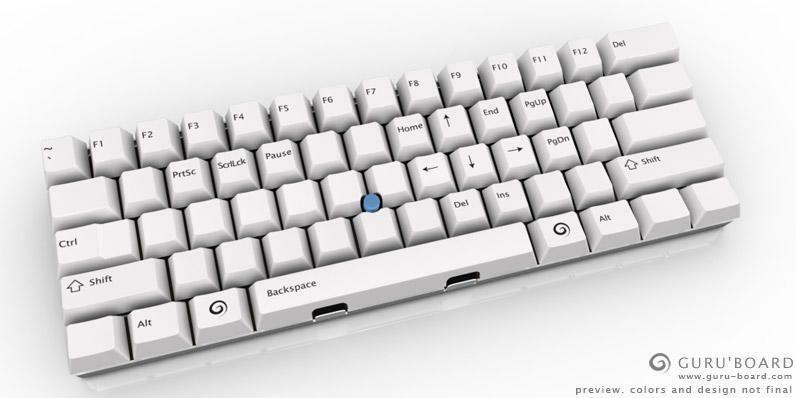 The MiniGuru puts all those things within easy reach by placing an integrated pointing stick between the G,H and B keys (if using a QWERTY layout) and by allowing a second layer of keys to be activated by pressing a swirl key on either side of the space bar. The second layer includes the cursor keys and some command keys. Personally, I don’t like pointing sticks but as the main focus of this keyboard design is to keep those digits as close to home comfort as possible, I can see the value in including one. 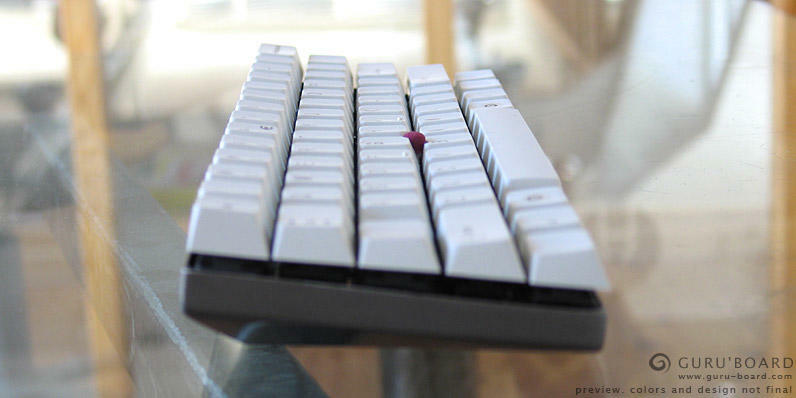 I also don’t like the influx of stealth keying that’s currently sweeping the keyboard market, where spongy silent keys are replacing that comforting tapping sound of industriousness. The MiniGuru puts the choice back in the hands of the user with the mechanical switches being available in a “clicky, tactile or linear” key flavor. The MiniGuru will connect to a Windows, Mac or Linux computer/laptop/notebook via miniUSB but also includes a couple of standard USB ports for direct device connectivity (such as a digital camera or pen drive or even a mouse if you must) and there are currently no plans for a wireless version which, to be honest, does seem a little odd. Pricing and availability are a bit up in the air at the moment so anyone interested in learning more is encouraged to visit the website. Are you as excited as I am about the forthcoming arrival of the MiniGuru or am I a sad and lonely geek?